North East Festival(NEF) is an attempt to promote North East India’s culture, resources across India, a platform to discuss critical issues of the region. This year this festival is going to held from 7th to 10th November 2014 at IGNCA Ground, Janpath, New Delhi. Here is the Program Highlight of this 4 days extravaganza. Food festival: Come and Savour – Ethnic food from the all eight North Eastern Region. Handloom & Handicraft Exhibition: Exhibition and Sale of North Eastern fabrics, Designs and traditional ornaments. Agri/ Horti Exhibition: Exotic and Indigenous fruits and vegetables of North Eastern Region. Art Exhibition: Exhibition of Paintings/ Art by artist from the North East Region. Photography Exhibition: Exhibition of photographs capturing the myriad hues of the Region. Tourism: Meet the tour operators of the region to plan your holiday to explore the “paradise unexplored”. Discussion Session: Be part of the process of building a better North East by taking part in discussions and seminars during the festival. Folk performance by artist from the different states and from Sangeet Natak Academy. Performance by Bands Like Local Train, Vikram Gogoi. Performance by popular Band like Soul Mate, Vinyl Records, Chethuwang. 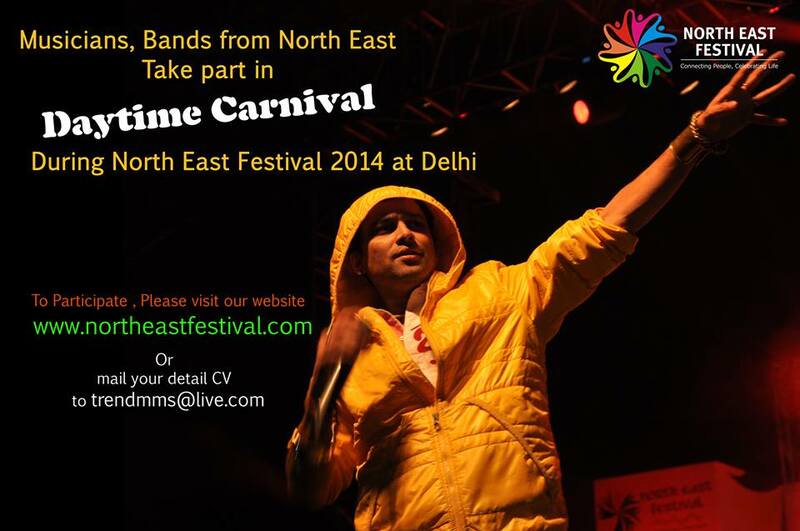 Performance by Bands like Footwings, Tetseo Sister, Minute-Of-Decay(MOD), Stuti Choudhury & Band. Fashion Show by emerging fashion designer from the region. Performance by Guru Rewben Masangva, Mayukh Hazarika and the Brahmaputra Balladeers, Frisky Pints. Fashion Show by top designers from the region. Discussion Sessions throughout four days with North East Stakeholders, Entrepreneurs and top policymakers of the country. Carnival starts at 11 AM.